The Dog Bottle Stoppers measure approximately 1 1/2" to 2" tall. Each unique Bottle Stopper has a solid plated base and 6 long chain, with a cork bottle stopper designed to fit any standard wine bottle. 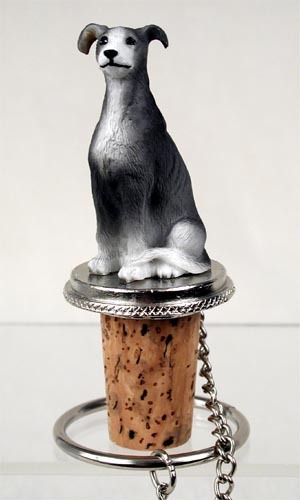 Using our Tiny One series of breed specific figurines, your dog will be the toast of the town when we mount one of our detailed, hand painted stone resin figurines on the top of this item. These are individually blister packaged and ready to give as a gift, or hang in your store.